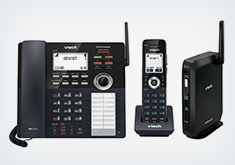 VTech’s line of DECT 6.0 cordless phones offer exceptional range, increased clarity, and enhanced security features. 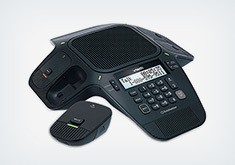 Several of the phone systems, equipped with the features listed above, can support up to 12 handsets. 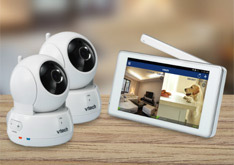 This means you can enjoy the best of VTech technology in every room of your home and or office. If you are in the market for an Eco-friendly communication’s center, then make sure to shop through VTech line of refurbished phones systems & phone headsets. The company produces numerous Energy Star Qualified models in their DECT 6.0, 5.8GHz and 2.4GHz phone categories with superb energy efficiency and extended VTech phone battery life. The multi line phones and multi handset phones systems are perfect for a growing business or home office. 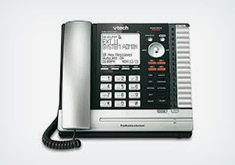 Another great tool for the workplace is the VTech line of VOIP Internet phones. 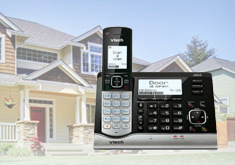 These models function with both your home landline service and VoIP Phone applications like Skype. VTech is always one step ahead of market demands, developing cutting-edge technology that will help the consumer steer through future technological advances. Since the late 1980’s VTech has been at the forefront of the electronic leaning aid industry. 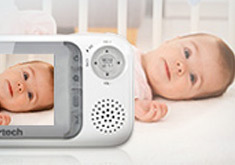 VTech educational toys, for ages 0 - 8, have truly changed the face of play and learn electronics. In 2005 VTech won both the “Best Overall Toy of the Year” and “Best Educational Toy of the Year” awards. From the Write and Learn Smartboard to the Genius Notebook, you are sure to find a product that will entertain and educate your little ones.